Welcome to Glam Hair Extensions, mobile service to all Sydney areas using 100% real Remy human tape hair extensions. We are the experts in providing a professional service and a 100% quality guarantee of our work. Glam Hair Extensions supplies and applies 100% pure Remy human hair, which can be, straightened, coloured, and curled. Our pricing is competitive in today’s market, and we have a wide range of colours to flawlessly match and blend with your natural hair for an invisible result. 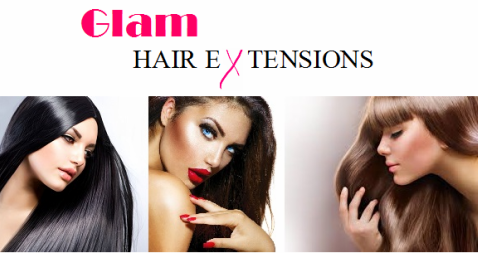 Glam hair extensions offer a free cut and blend, free brush & free 10ml argan oil treatment bottle with every service. ​Tape hair extensions are a very popular method. Using tape extensions is a great choice, considering they are properly applied and the hair is of great quality and are cared for. Your own hair is placed between the tape bonds and heated on for a secure hold. ​Tape hair extensions blend in better for clients with short, fine and thick hair compared to other extension types. ​Tape hair extensions are also a great choice if you tend to wear your hair up as the tapes are less visible in your hair compared to other methods. While showering, conditioner should never touch the bonds of the tape extensions. Re-taping is required every 6-8 weeks depending on the speed your hair grows. Is the hair used real? Glam hair extensions use only 100% quality real human Remy hair, which can be coloured, straightened and curled. Following our advice for proper care of your hair extensions will avoid any damage that it may cause to your natural hair, it is also recommend having your extension re-tightened every 2-3 months. Just like normal hair, sweating, swimming and applying heat will shorten the lifespan of your extensions. It is real human hair, so it will take damage as your natural hair. Technically speaking you will get 2-3 tightening's before you need a new set applied. The type of hair Glam Hair Extensions use? Glam hair extensions use 100% 6A Grade European Remy human hair. We hair comes in 22inch, these can be cut shorter to your requirements. What information does Glam Hair Extension need whilst making a booking? It is advised to allow 48hrs notice for any cancellations or rescheduling of appointments. ​We accept visa, mastercard, amex, cash & Afterpay. avoid conditioning your natural hair 48 hrs prior to application, and always avoid conditioner near the tape adhesive. It is advised to wait 48hrs after your appointment before applying shampoo to your hair. As early contact to your extension with cleansing chemicals, may result in your extensions sliding out. Avoid using products which contain sulfate, such as dandruff shampoos. Use recommended products that are designed to improve the condition of your hair extensions such as, Herbal essence hello hydration, Moroccan oil and argan oil. When showering, tilt your head back and cleanse from the top of the head downward. Avoid facing your head down. To dry your hair, use a microfiber wrap or a towel to remove moisture. Avoid scrubbing motion. If using a blow dryer, use medium to low heat. ​​Always avoid actual contact of conditioner on the actual 'Tapes' of the tape extensions. Brush your hair twice a day using a detangling brush we generally give these for free during your appointment (full head or more service with use of our extensions only) depending on stock levels however, these can be purchased on eBay or hair suppliers which are specifically designed for hair extensions. When brushing start at the end of your hair (brushing downwards) working your way up whilst holding the extensions. Once you reach near the top of the extensions hold onto the bonds whilst brushing as this prevents knotting, and shedding of hair. Do not use a hard bristled brush. This may cause the extension strands to slip out. Do not use a comb near the scalp. Hair straighteners and Curling irons may be used on our hair extensions, keep them at least 3 cm to 4 cm away from the hair bonds. Do not use a hair dryer on high heat close to your scalp. Avoid putting any form of oil near tape adhesive. Activities such as swimming, in salt water or chlorine may shorten the life of your extensions. It is advised to wear a swimming cap. It is also recommended to tie your hair in a pony tail during sports/exercise and immediately gently wash your hair to remove any sweat. ​When colouring or dying your hair always keep dye away from the actual hair extension bonds as the dye can eat away the bonds and also cause your extensions to slide out. Same Day Hair Treatments: Hair colour or chemical treatments done in the same day of application will cause slippage. Chemical processing should be done a week before. Product Buildup: Excess product buildup breaks down the tape. No alcohol or oil based products while wearing tape extensions, it will break the tape adhesive down. Naturally Oily Scalp/Hair: There are those that have excess oil and have naturally oily hair. Tape extensions won't hold as long. ​NOTE: We highly recommend exercising our care tips for the hair extensions, we will not be held responsible for any damage caused e.g. pulling, cutting, bleaching/colour damage, use of improper products (shampoo/conditioner) etc.